I started my cycling life aged four. By the time I had my 11th birthday, I recieved my first racing bike a 5 speed Raleigh Olympicus. I used to live in Tooting then and myself and a friend used to ride out to Sutton, Crawley and a few places in Surrey to get away from the streets of south London. I had a break from cycling between 15 and 24 years of age prefering motorbikes instead but I was into running doing lot’s of 10km races with a fastest time of 38 minutes in the croydon funrun. I used to run to Mitcham and back every day 8 miles. 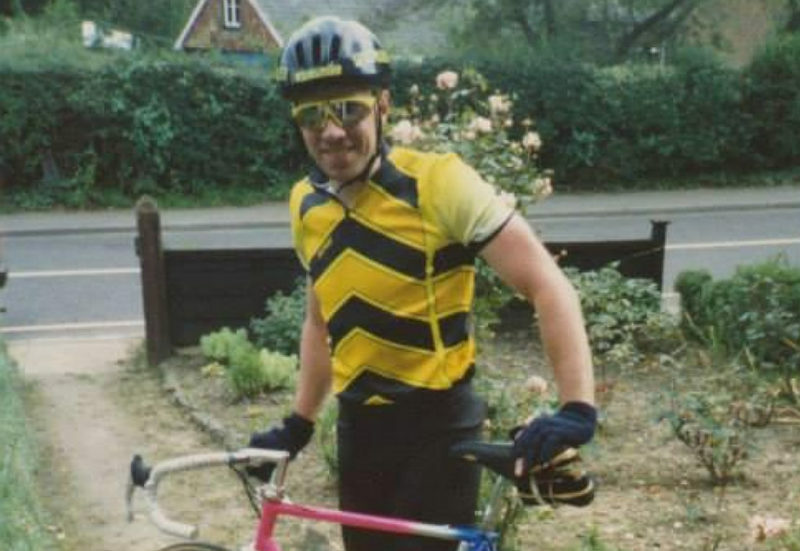 Back in 1986 I met my wife and had to sell my motorbike and start cycling to work. I bought an old green 3-speed Raleigh roadster to ride to work on. I rode this bike for 6 month’s before things got serious. I had started doing Shotokan karate which I got up to green belt in. I had also done Aikido for six month’s before this so needed to get really fit. 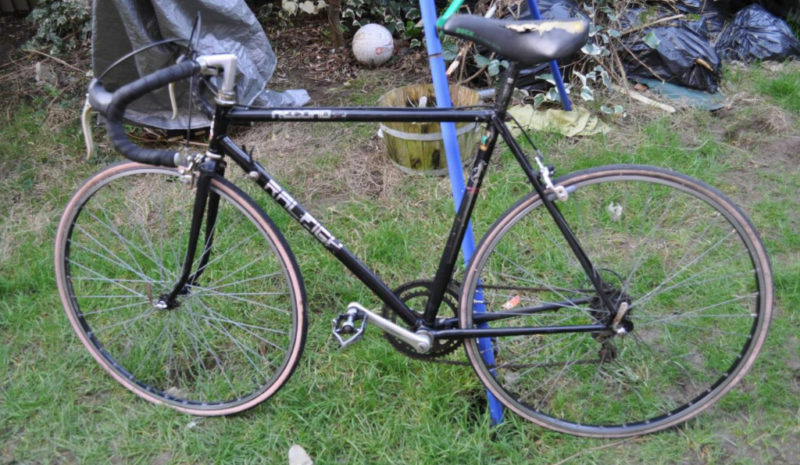 I bought a Raleigh Equipe 12 speed racer for £150, paid for it monthly. I was getting more and more into cycling now riding to and from work everyday. At work I met an ex-racing cyclist who had a few racing frames hidden around the factory. He had noticed me cycling to work and said i should join a club. I was 26 at this point. I looked in the local paper to see if there were any cycling clubs I could join. It was a bit of an underground sport in those days. I decided to ring Mr John Turnbull of the Anerley Bicycle Club and so I joined the oldest cycling club in the south of England. I was racing within a month so needed something a bit faster. I bought another Raleigh this time a Reynolds 501 record sprint with 12 gears. It was only 25 lb in weight and had Huret gears. I Rode my first 25 mile time trail in 1989 and I did 1 hour 16 minutes. I was hooked and was doing 10’s and 25’s for the first 2 years and hilly sporting courses. By the summer of 1991 I had a bit more money so spent £1000 on an Italian Daccordi built with Colombus SLX tubing and 14 speed Camapagnolo chorus groupset. This weighed 21 lbs and was a really serious racing bike. The Anerley had lots of time trail riders by now and we would race most weekends. By 1994 I was down to 1 hour 3 minutes for a 25 Mile TT at one point three of us Anerley riders won a team time trail the Newbury wheelers 25. The other two rider’s being Keith Herbert senior in charge of racing and my buddy Max Murrey Brookes. We would do mainly Sunday morning races with Keith picking Max, me and John Dadson up to race sometimes as far as Newbury on the A4 or Essex on the A12. I also did 1 hour 16 minutes for a 50 mile TT and I had also ridden 2 100 mile trials. My best 100 time being 4 hours 48 minutes on Essex roads where John Dadson set a club record of 4 hours 11 minutes. In the winter we would ride really long distance’s over a 100 miles in reliabilty trials. 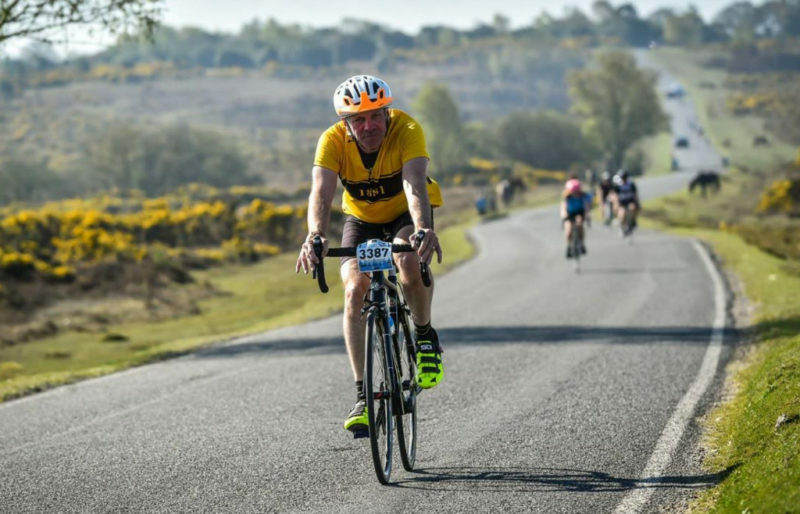 Most of the club racers would ride so we would leave Croydon in the dark ride to Halstead, do a 65 mile ride in the Ashdown forest and ride back to Croydon as it got dark again. On one occasion the whole club went down on the ice only Keith Herbert and Maureen his wife stayed upright, but we all got up and finished the ride the last two hill’s being Toy’s and Star Hill. My rear gear had been pushed in due to the fall so I had a low gear of 42/21. The club on many occasion’s would have the most riders in the event so we would win the team award. Another event we would do would be the Moon Trophy in early April over 10 miles on the Dorking course we would all ride in a fixed gear of 73 inches with your gears checked and locked. My time was only a few seconds faster on gears. By the winter of 1998 my health went downhill. 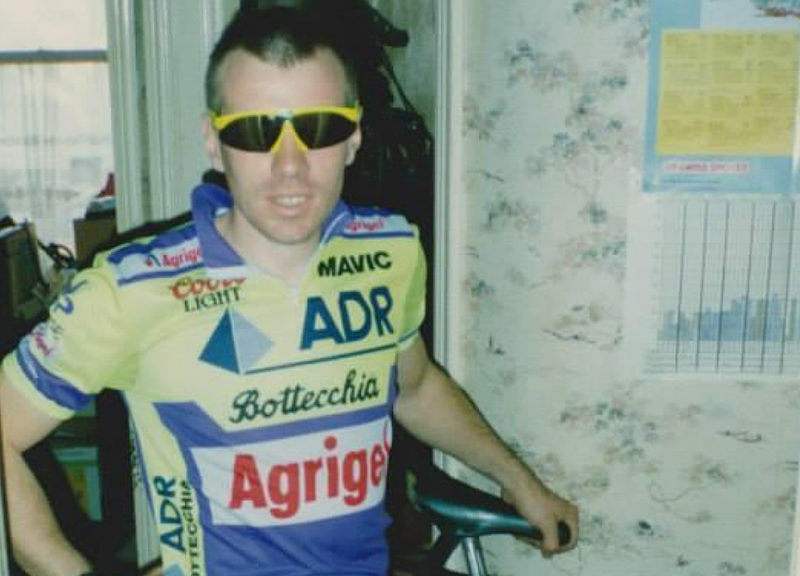 I had exercise induced asthma so as one of the inhalers was not legal at the time for racing I had to stop. I stopped riding for the club now too. I just rode to keep fit. By the year 2000 i had started a new marital art with my 9 year old son Seb. Tang Sou Dao had taken over my sporting life so we trained twice a week. I also went weight training twice a week and was still cycling 50 odd miles. 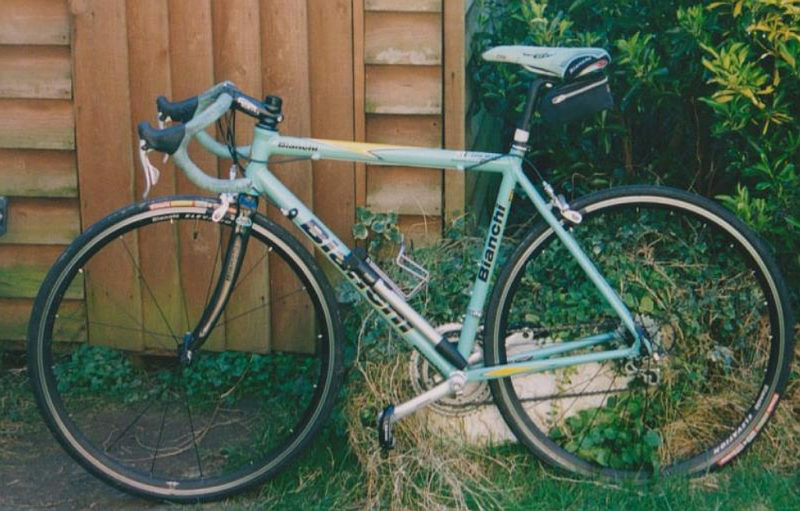 By now I had a Bianchi racing bike with Campagnolo Veloce 16 gears and my first Ali frame with STI shifters. 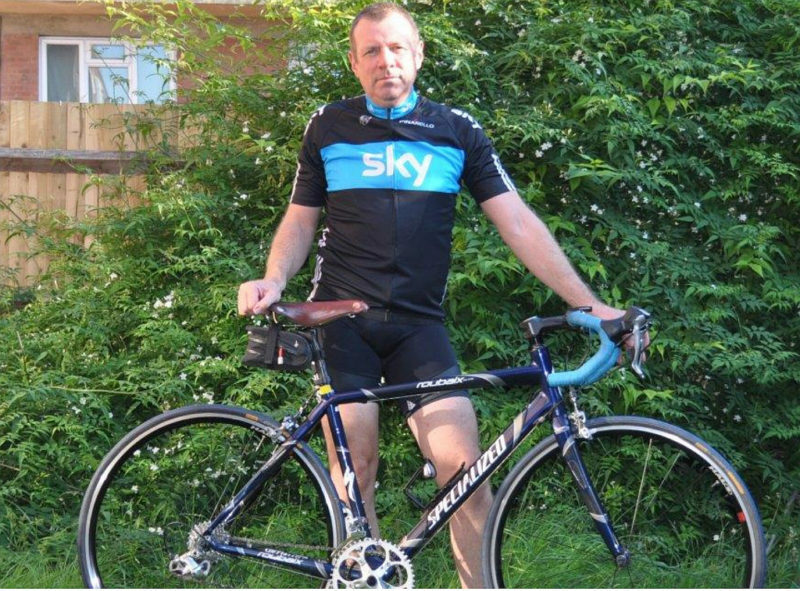 This bike was far too hard a ride – luckily it got nicked from my shed 2 years later. 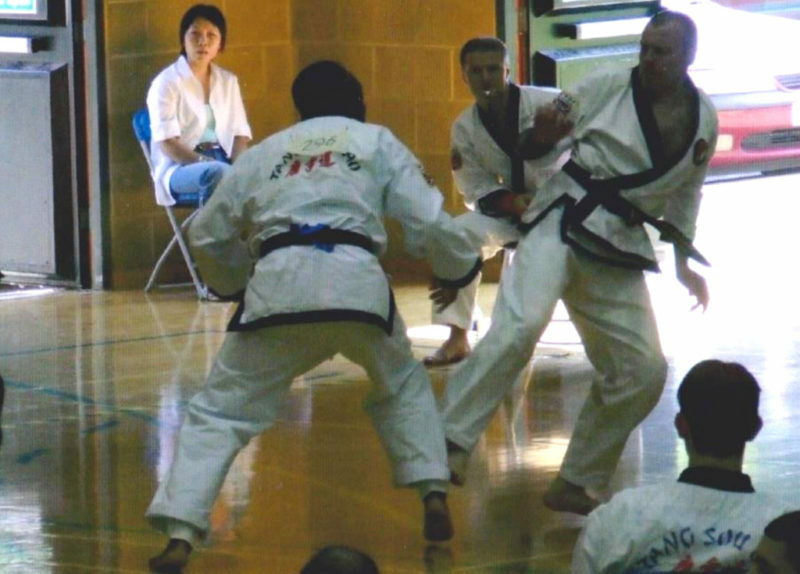 By 2006 myself and Seb had both passed are black belt grades. We had fought at the ational championships a few times too. Both of us had reached finals but we both had to settle for silver. Seb was now fourteen and had got bored of Tang Sou Dao so we both stopped training. I went back to cycling as my main sport,i had replaced the Bianchi with my first carbon bike a Specialized Roubaix 2006 model. It was the cheapest carbon bike on the market, 18 gears all Shimano 105 with an Ultegra rear mech and what was called Flightdeck STI levers. Only about 20lb in weight this was a new breed of bike a sportive model with Zertec inserts in the frame, compact gears for easy climbing and a longer wheelbase. As i had put on 2 stone through weight training and martial arts it was just the bike I needed. As you can see from the next picture I was 13 stone at this time up from my 11 stone racing weight.This picture was the summer of 2012. 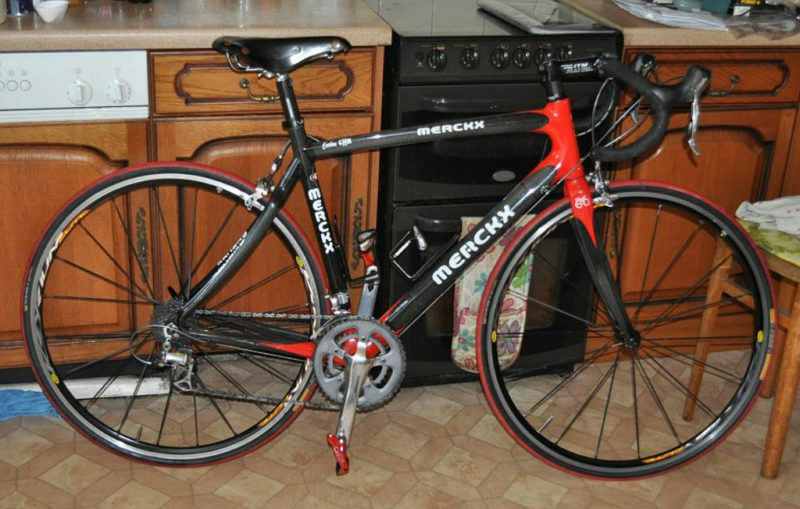 The Specialized was joined by an Eddy Merchx’s CHM sportive bike,the first sportive bike Merchx had made back in 2008. This was again carbon fibre but with full Shimano DuraAce 10 speed compact gears, weighing 17lb so very light. It had a tighter rear triangle so was a faster handling sportive bike. The story behind this bike was I went to Geoffrey Butler’s and said what can you build me for £2000. This was the result, carbon frame, DuraAce,and Mavic Elite wheels. They had two other people walk in and order the same spec as this one afterwards. Another change had happened at this time too. I had bought my first ever car a 1999 John Cooper LE classic Mini. I was always a fan of classic cars and motorbikes so was looking around for the perfect classic to own and the Mini fitted the bill. By 2011 I had rejoined the Anerley BC having just caught up with the club when out riding on my own the only person who knew me was Ewa. Cycling really started to take off for me again within 6 months I was leading the Thursday club run. I was looking around for a new bike, one I could take cycle camping. 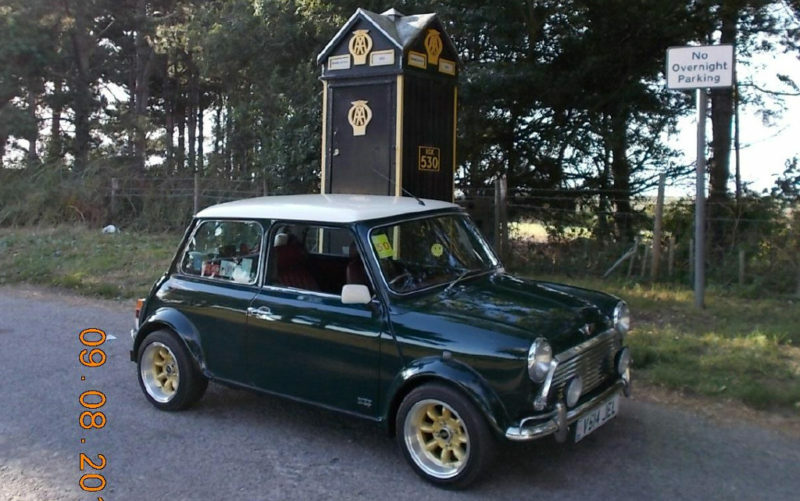 It had to fit into a classic Mini, had to be a racer. What should I buy? I ordered an orange TSR 30 tour,with a rear rack,computer,and rear bag. I now started doing more touring rides with a camping tour of the New Forest in the Mini with a two man tent and the Moulton setting on the back seat in two Moulton bags. I also took the TSR on hoilday in Norfolk that year so i spent a week touring around North Norfolk too. 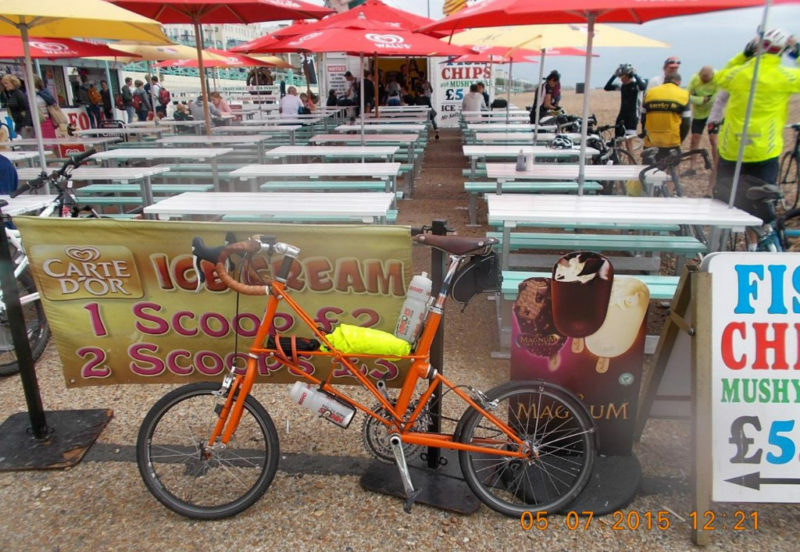 That year I also did the London to Brighton and back with my clubmate George Bruce. I surprised quite a few riders when I went past them on Ditchling Beacon too. The next year i hired a car and went on a tour of the Isle of Mull, camping at Graignure. I did three long rides on the island, the low gears were just right for some of the long climbs going towards Tobermory. One day I rode to Iona in the rain so was glad I had wet gear in the day bag. 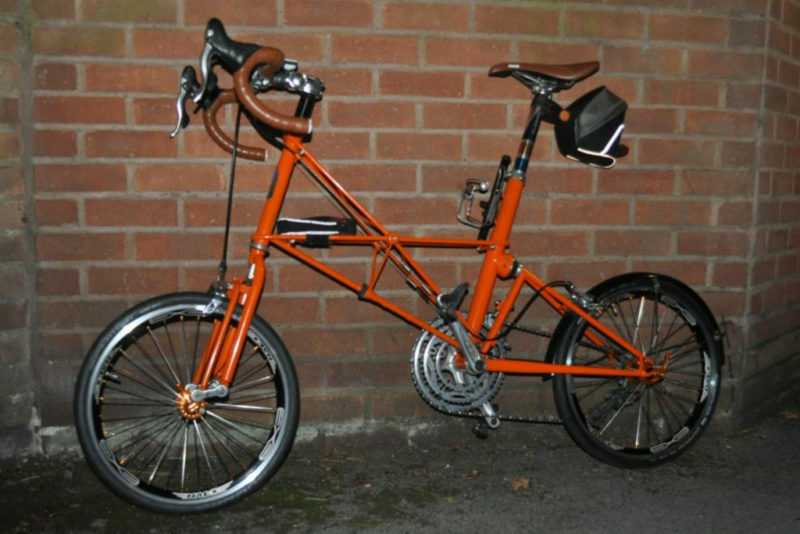 Oh my Moulton like the mini has a name too, it’s called Little Nellie. I’ve added a few things to it over the last couple of years. It has an orange Kapz headset top and handlebar ends and a Union Jack Thomson seat post. I had a stiffer spring put in the front too as I like a harder front end for climbing. A recent addition has been new Hope hub wheels in orange with 32 spokes and Halo rims these wheels have lowered the weight to 24lb. 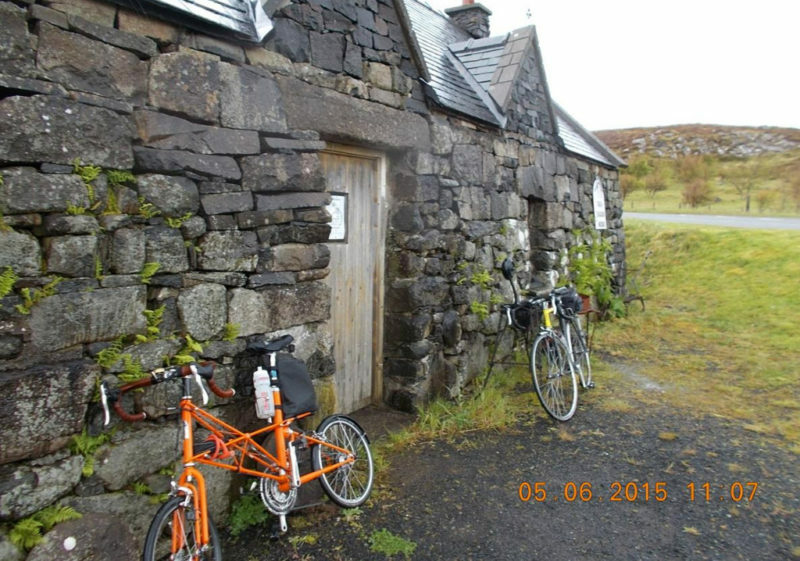 In 2015 the Moulton did a second tour of the western Isles, this time with my clubmate John D we stayed at Craignure Isle of Mull again but this time in the bunkhouse. 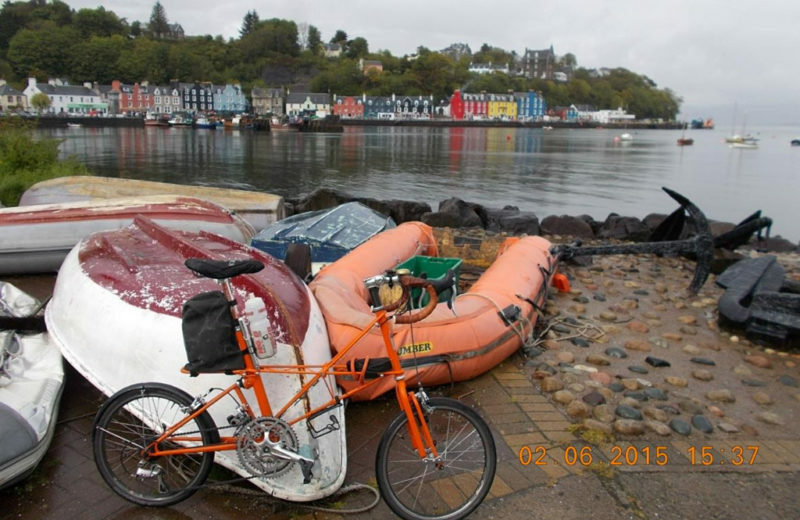 We did two rides on Mull,the weather was very bad up there that year in June, we could not even get over to Iona. After Mull we went up to Skye for three days and did two rides on the island. Skye roads where a bit busier so we liked Mull more. I also did another camping tour of the New Forest and took the Moulton up to Norfolk for the 3rd time. It’s ideal for New Forest roads where you can ride it across most of the forest tracks. I gave the Moulton a rest in 2016 and bought a new sportive bike – a Giant Defy Pro 2 carbon fibre again with Ultegra gears and disc brakes. This bike is a bit heavier than the Merckx weighing about 18 lbs. ! 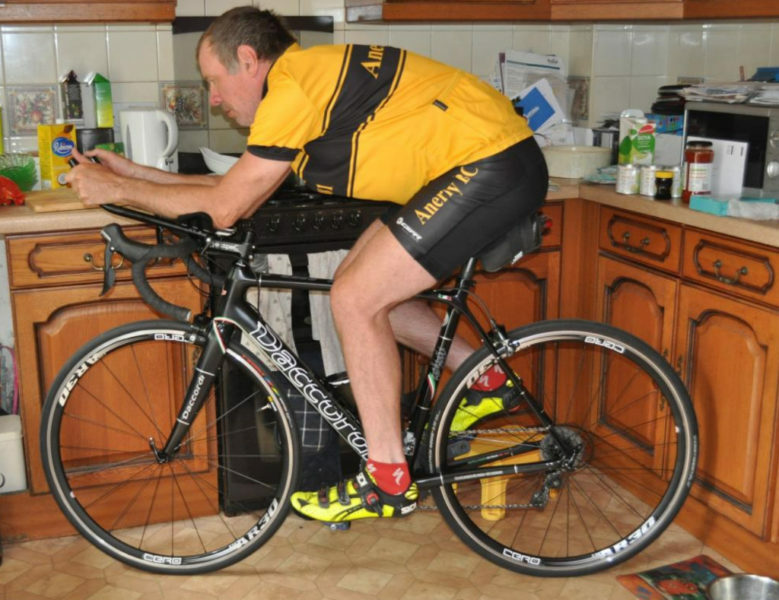 mainly use it for sportives but did do a 10 mile time trial on it this year – the first one since 1998. I also did 3 other 10s on the Merckx too getting down to a 28 minute 20 second ride. 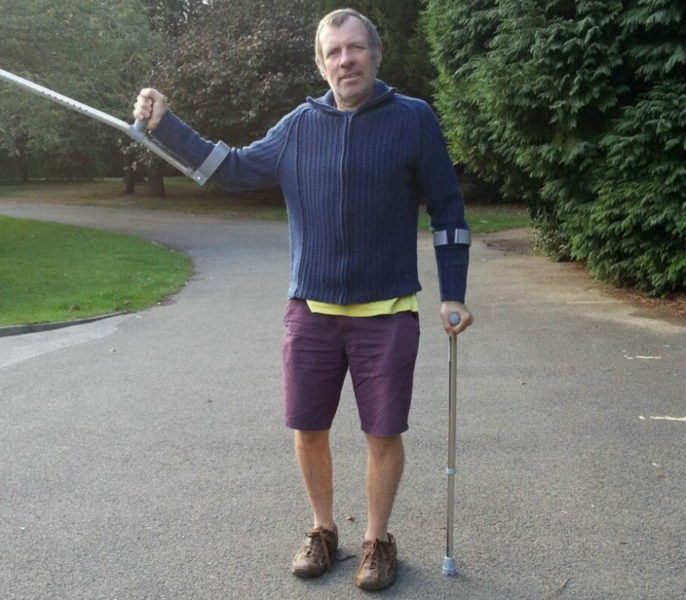 The Giant ended it’s days on the 29th of September 2016 when an old lady drove into the back of me which resulted in three month’s of not riding, the longest time off the bike in 32 years. Luckily the bike was insured so I was contacted by the British Daccordi importer who had just the bike for me. It was a Daccordi Roll Over in Carbon with 105 Shimano components and Fulchum wheels,I had all the Ultegra parts from the Giant fitted to the Daccordi to make it lighter and bought some new Cero wheels too, The bike weighs 17.5lb now. It’s a sportive race bike which is very stiff but also very comfy. I use it for time trials and sportives. I did a few 10 mile TT on it this year and last year with a best of 28 minutes and 5 seconds. 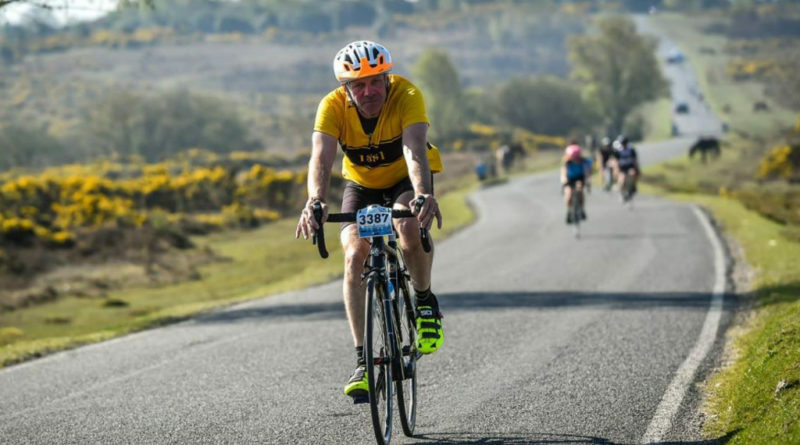 I have also done two pretty good sportives on it the Tour of Cambridge this year 2018 80 miles in 4 hours 10 minutes and the new forest spring sportive in 2017 over 70 miles in 4 hours 25 minutes. How Little Nellie look’s now,in 2019 I plan to do another Tour of the Western Isles and at least one 10 mile Time trial to see how she goes in a race.